All this week the Daily Palette will be celebrating some of our favorite jewelry made by Iowa artists. These objects vary significantly in style and inspiration; some are amusing, some are romantic and thoughtful, while others are simply beautiful. 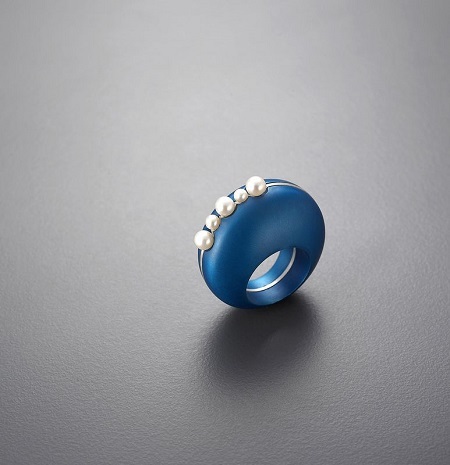 Leeyeon Yoo earned an MA in Jewelry and Metal Arts from the University of Iowa in 2012. This object was selected from the Graduate Archive at the University of Iowa. For the past seventy-five years the School of Art and Art History has collected thousands of artworks by artists attending the School's graduate studio programs. Each graduate student was required to leave behind a work they completed during their graduate studies here at the University of Iowa. The collection contains over 6,000 paintings, prints, photographs, sculptures and other art objects. The collection is unique in the country and provides a critical glimpse of academic American art over much of the last century.